The performances may be old news, but they have been refreshed nicely in Karel Soukeník's SACD remastering. The Dvořák, especially, comes up with a vivid presence missing from the old U.S. Seraphim LP. (The Seraphim cassette was actually a bit better.) The horns are deep and refulgent at 0:37 of the first movement; the principal is velvety in the first movement's second theme. The only downside is that, while the treble is not aggressive or stridently unmusical as on some recent recordings, the brightened sound becomes aurally fatiguing over the course of the concerto. The remastering also brings out more of the character of Sir Adrian Boult's previously neutral-sounding conducting. Now, the tuttis sound not just forthright but affirmative – note the launch of the first-movement recap (with the second theme!) and the brass statement at 9:12 of the finale. The conductor allows the woodwind soloists the space to phrase sensitively; there is even the occasional surprising touch of rubato in the strings, as at 5:05 of the Adagio. Boult's general laissez-faire attitude, however, is still a drawback. Some tutti chords in the first movement are approximate rather than unanimous in attack; much of the slow movement is simply too loud; the accenting at the start of the Finale is thick and prosaic, and the movement closes not with fire but with a thud. Rostropovich, as always, plays wholeheartedly. His big tone now seems more reasonably scaled to the orchestral image, and his fetching pianos benefit from his ample reserves of sound. The first movement goes wonderfully, save that conductor and soloist build the exposition so assertively that its conclusion feels like the end of the movement! The Adagio is simply sung, though not particularly wistful until the coda, when Rostropovich's restrained "answers" are bathed in nostalgia. The Finale comes off less well: the soloist sounds heavy and self-conscious – though the dotted rhythms are appropriately bouncy; on the other hand, the episode at 11:09 is ineffably moving. The Schumann, originally issued on DG, certainly has its moments, but it also keeps hitting dead spots. Rostropovich intones the opening theme sensitively, if again self-consciously, and is deft in the incidental flourishes. The first tutti is shaggy, and woolly in attack, but Rozhdestvensky shapes it dynamically and with purpose. The second theme is delicately pointed, the development by turns ruminative and disturbed; unfortunately, Rostropovich himself lets the momentum flag after 6:51, heading into the recapitulation. In the gentle Langsam, the soloist again offers well-supported soft playing and flexible inflections, but the movement seems inert, coming to life only when the first-movement material returns at 4:02. The finale is firmly grounded; the back-and-forth exchanges in the development work nicely at this slightly deliberate tempo, although the soloist's triplet cadenza at 6:11 feels both becalmed and superfluous. The Pezzo capriccioso, recorded in performance in Moscow, is solid middle-tier Tchaikovsky: lyrical passages cast in almost manipulatively rich harmonies alternate with scurrying figurations for the cello. 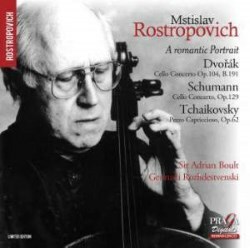 Rostropovich attacks the opening gestures dramatically, with hearty accents; scales down tactfully for the broad cantabiles; and impresses in the rapid passages, here and there threatening to pull ahead of Rozhdestvensky's orchestra. The front of the booklet, and the rear endpaper, call this "A Romantic Portrait". The back of the booklet, and the disc itself, are labeled, "Short Romantic Portrait". I would go with the main title, myself: at nearly seventy-two minutes, this is not exactly "short".